Anne, Julie and Julia planting the rhubarb donated by RV Rogers at Pickering. Maria Mahon, Kitchen Gardener, gives an insight into the plans and growing that support Useful/Beautiful: Why Craft Matters this spring and summer. The aim is to have a kitchen garden that is beautiful to look at and is useful. The vegetables are all produced using organic gardening techniques, without any pesticides or herbicides and instead working with nature using techniques like companion planting. This means that unlike the supermarkets the vegetables will not be perfect and maybe a little bit wonky. 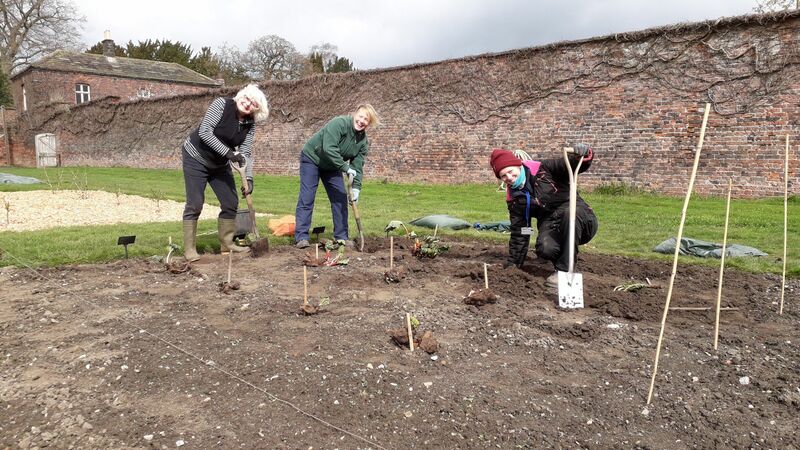 Last year, Seeds of Hope focused on using every available piece of land in the Walled Garden to cultivate vegetables. This year, linking in with the Useful/Beautiful theme in the House, the plan is to introduce lots of flowers in the vegetable borders. The flowers will not only look beautiful but will each have a purpose. For example, the calendulas will attract predators such as lace wings, and hover flies that will eat the aphids that like to feed on the vegetables. Companion planting is a key theme in the Walled Garden along with herbs. The top border will be planted with lots of herbs and flowers that can be cut or are edible. These should look and smell beautiful. The first vegetable we hope to celebrate across all Departments will be Rhubarb, which we have been force growing and growing naturally. It’s just ready now. Then New for this year will be soft fruits, gooseberries, strawberries (ready for Wimbledon) and different varieties following through all season. We’ve introduced hand-crafted hazel growing supports for the small pumpkins to grow up, they tie nicely into the skill and craft theme of the new exhibition and are lovely to look at. In the coming months it will be all about celebrating the seasonality of fruit and vegetables across many areas of Harewood. The produce from the Walled Garden will feature in the Courtyard Café and any surplus will be offered to the Courtyard Shop, to be made available for sale to our visitors. Posted 9 April 2019 at 5.07pm by Lindsey Porter. Filed under: Walled Garden.